"Save the Falls of Clyde"
Incredibly, a very rare large 130 year old sailing ship has been under threat in the 21st Century! The immediate threat has now been averted. Read the remarkable story of how this ship has been saved from destruction by the efforts of a group of concerned people in Hawaii and others from all over the world. The story starts from the bottom and progresses to the top. Why did Bishop Museum do so little to preserve Falls of Clyde Good question. Generations of island residents have come to consider the four-masted schooner Falls of Clyde as much a permanent part of the waterfront as Aloha Tower itself. The National Park Service seemed to agree, designating the ship a National Historic Monument in 1989. And so, while the Falls has struggled to find proper financing over the years, few were prepared for Bishop Museum’s dramatic announcement last year that plans were in the works for Falls of Clyde to be scuttled. Christopher Pala explores just how things went so wrong, and asks whether the museum ,as it has claimed, truly did everything it could to preserve a beloved local –and international–landmark. For most of that period, the institution spent little more on the Falls than the few tens of thousands of dollars produced by a $500,000 endowment set up in 1994 by the late Robert J. Pfeiffer, then chairman of the Alexander & Baldwin holding company. The museum failed to perform minimal maintenance on the ship, such as installing zinc anodes that would have stopped hull corrosion at a cost of only a few thousand dollars a year. The work that was done did more damage than good to the ship, according to two ship surveyors, one hired to assist the museum in determining the ship’s fate. The museum consistently misrepresented the source of the first $300,000 grant as coming from the Save America’s Treasures Fund, when in fact it came from another, much laxer part of the National Park Service. The museum’s campaign to give the ship away raised eyebrows in the historical maritime community because it seemed designed to achieve just the opposite. From April of last year, the museum appeared intent on having the ship sunk off Honolulu and avoiding giving it to a group called the Friends of the Falls of Clyde, which wanted to save it and try to eventually raise enough money to restore it and keep her as a floating museum. The Friends were eventually able to buy the boat on September 25 for a symbolic $1, but not before the museum had destroyed the ship’s steel rigging, raising the future cost of restoration. In 1968, after Lani Booth, the heir to a family fortune, bequeathed the Bishop Museum $1 million, its director, Roland Force, persuaded a reluctant museum board of directors to acquire the Falls from a group called the Falls of Clyde Maritime Museum, headed by Honolulu Advertiser columnist Bob Krauss, and spend a quarter of the donation on it. The Falls had served as a floating fuel dock in Alaska from 1922 to 1958. In 1963, its owners decided to sink it and turn it into a breakwater in Canada. At the last minute, a group of enthusiasts in Hawai’i led by Krauss brought it back to Honolulu and, over the next two decades, had her restored, except that she never received sails. The center board members contributed “very little money and a lot of talk,” Pratt said. When the center became unable to pay its mortgage, the museum for the second time acquired the center and the ship. Pratt described the museum’s management as “strictly a stepchild operation” and resigned in protest from the Bishop board when the museum dissolved the Maritime Center board. “They get things and they don’t care for them, it’s appalling,” he said. In November 2001, the office of Sen. Daniel K. Inouye announced the fiscal year’s earmarks, which included $300,000 for the Falls of Clyde. “This appropriation for the Save America’s Treasures budget would be used by the Bishop Museum to preserve the Falls of Clyde,” a statement read. It was matched by a donation by Pfeiffer. The grant earmarked by Inouye, in fact, went through another part of the Interior Department budget called the National Recreation and Preservation Account, which entails much looser supervision–from Honolulu, not Washington–of how the money is spent. Also, Save America’s Treasures grants entail an obligation to care for the object of the grant for at least 50 years, while the other fund does not, according to Hampton Tucker, Chief of the Historic Preservation Grants Division of the National Park Service, who administers the Save America’s Treasures grants. In 2002, the museum commissioned Dorian Travers, who had worked on the ship years earlier as a deckhand, to design a work plan around the grant. He presented it in March 2003 and a summary of it was forwarded to the National Park Service and accepted. In early 2007, a group of fans of the Falls paid for the hiring of Joseph Lombardi, a Massachusetts ship surveyor experienced in historic ships, to examine the Falls and list what repairs it needed. What he found, he said, was a ship that had degraded more in the previous 20 years than any he had ever surveyed. This led that group of fans, led by Clifford Laughton, to withdraw. In addition, he said, only part of the preservation plan had been carried out. The plan called for spending $346,604 for sand-blasting the interior of the hull, and the rest, a total of $271,243, for repairing the rigging ($144,100), improving the mooring system ($13,673), fixing the leaking deck ($30,000) and buying a cathodic protection system–a more complex way than simple zinc anodes to stop corrosion of the hull through electrolysis ($4,070). Lombardi and Travers, the author of the plan, agreed in interviews that in fact, the only part of the plan that was done was the sandblasting. There was no evidence that the $271,243 for the rest of the work was ever spent for the purpose for which is was sought — except for the anti-corrosion equipment, which was bought, never maintained and promptly stopped working, and routine maintenance and repair, which the grants were not supposed to pay for. Gary “Skip” Naftel, a Honolulu ship surveyor who became the vice president of the Friends of the Falls of Clyde, the ship’s new owners, concurred. Lombardi called the sandblasting work “an abomination” and said it had done more damage than good. He had it stopped as soon as he soon as he arrived. Lombardi said he was unable to understand why at least part of the $600,000 grant was not spent on dry-docking it. “You normally dry-dock a ship like this every five years, and this one hadn’t been dry-docked in 20,” he said. An examination of the Maritime Center’s tax records bear out Lombardi and Travers’ claim: the only item that appears is the sandblasting, for $345,732, paid to Consolidated Painting LLC, over three years ending in June 2007, at which point the museum wrote to the National Park Service and declared the work accomplished. Consolidated Painting’s owner, Joseph Ferrara, confirmed the amount but denied that his company’s work had damaged the hull. The museum’s final report to the National Park Service mentions the preservation plan, but it details only the sandblasting and minor routine maintenance. It states that “other items that were repaired included the rigging and top and upper masts,” but gives no further details of a project that was to have cost $144,100. The Honolulu staff of the National Park Service, which administered the grant, declined to comment. Holly Bundock, a spokeswoman in Washington, said that since there was no Park Service requirement that this grant be matched, the service was satisfied as long as its own $300,000 was spent as specified, even though the original budget submitted to the Park Service was for $600,000. When it was pointed out that the museum’s own press releases said that the matching was done by Pfeiffer, not the museum, he denied that Pfeiffer had made that grant and said that the museum only had access to the interest from the 1994 endowment that Pfeiffer had made for the Falls. “That creates income of $30,000 a year, we can’t touch the principal,” he said. Collis went on to assert that Ferrara, the owner of the company that did the sandblasting, “tells me he spent close to $1 million on that project, but we only paid him around $600,000.” Ferrara denied telling Collis this, saying that while he did lose some money on that job, it was because Collis took too long to make key decisions. Collis insisted throughout the interview that the grant had gone through the Save America’s Treasures office, as does its own press releases, available online, although the cooperative agreement between the park service and the museum makes it clear the park service staff are in Honolulu, not Washington, where the Save America’s Treasures grant is located. He said he had no explanation of why the corrosion control equipment was never maintained. Requests for interviews with Elizabeth Tatar, which the National Park service lists as the museum’s person in charge of executing the grant, and with museum president Tim Johns were refused. The museum also drew criticism for announcing this year that the ship would be sunk if a buyer willing to spend in excess of $30 million could not be found by this past summer. The Friends, led by Bruce McEwan, vice president of Young Brothers, and Naftel, the surveyor, coalesced after the museum announced its intention to scuttle the ship, trying to prevent the sinking while scrambling to raise money, incorporate as a non-profit and get insurance for the ship. As late as September 25, the day the Bishop board voted to accept the Friends’ proposal to buy the Falls for a symbolic dollar, Collis, in an e-mail to McEwan, said the written commitment the Friends had obtained from the Marisco dry-dock in Wai’anae was insufficiently hard. “This has to be addressed immediately as per the requirement of the agreement or I suspect the board will not vote in favor of transferring the ship,” Collis wrote. Still, that evening, the board voted to accept the offer, but the hostility between the two groups was palpable on the day of the handover ceremony. After the signing of the papers, the handing over of a dollar bill and the launch of a “Million Quarters Campaign” modeled on Bob Krauss’ “Million Penny Campaign” for the Falls, Johns, the museum president, smilingly took the lectern to announce he was making a personal contribution to the campaign. “It was an insult,” growled Naftel. "Just a quick note to let you know that ceremony went well. It was well attended. A bag piper, Scottish dancer and singer entertained us. Of course there was lei giving and hugs. Speeches were made by Bruce McEwan, Ginger Krauss and State Representative Corinne W.L. Ching. Finally I shall be allowed aboard the ship as of to-day. I have not been aboard her since January. I miss her! This will be my 21st year working on her. There are tow lines attached to her bow. That is how close she was to be taken out and scuttled.....We got the ship. This is not the first time she has been saved in the 11th hour. What character she is". to view photos taken by Keven Williamson at the handover ceremony. After several weeks of negotiations. the Bishop Museum's Board of Directors has agreed to sell the classic sailing ship Falls of Clyde to the Friends of Falls of Clyde for a nominal sum. To mark this important moment in the ship's 130-year history, on TUESDAY, SEPTEMBER 30, 2008, at 5 pm Tim Johns, president of the Bishop Museum, and Bruce McEwan, president of the Friends of Falls of Clyde, will sign the transfer documents in a special ceremony to be held at the Hawaii Maritime Center where the ship has been berthed for the past two-plus decades. In addition, the FoFOC will announce the launch of the MILLION QUARTERS DRIVE to raise funds to start the preservation work. The MILLION QUARTER DRIVE is based upon the original fundraiser put together back in 1958 by the late Honolulu Advertiser columnist Bob Krauss in which he challenged Hawai`i school children to collect a million pennies to help underwrite the costs to bring the ship back to Honolulu. His daughter Ginger Krauss will attend the ceremony and share her recollections about her father's support the Falls of Clyde which continued right up to his death at the age of 82 in 2006. Afterwards, attendees are invited to attend a pupu reception (no-host bar) on the lanai at Gordon Biersch Brewery and Restaurant in the Aloha Tower Marketplace. In order to get a reasonably accurate headcount, RSVP acceptances only to swood@hoku.com. On December 12, 1878, shipbuilders Russell & Co. launched the four-masted, full-rigged ship Falls of Clyde at Port Glasgow, Scotland where it became part of the Falls Line fleet - all of which were named after Scottish waterfalls. Built with a wrought-iron hull with a net tonnage of 1748 tons, she had a registered length of 266 feet. At the time of her launching, no one envisioned that her life under sail would last for more than four decades and that this stalwart ocean wanderer would visit ports on all continents with the exception of Antarctica from her first voyage to Karachi in 1878 under British registry until she was sold to an agent of Capt. William Matson. In January,1898, flying the Hawaiian flag, the Falls of Clyde arrived in Honolulu. Capt. Matson then modified the ship’s rig to that of a bark and built a large wooden deckhouse forward and a charthouse on the poop deck. Later registered in the United States, she carried sugar from Hilo to San Francisco until1906 when the Associated Oil Company in which Capt. Matson had an interest bought the ship and converted it into an oil tanker in 1907. Added were 10 tanks within the hull, a boiler room, and a pump room with a carrying capacity close to 750,000 gallons. She also carried molasses from Hilo to San Francisco over the next13 years. In 1921, she was sold to the General Petroleum Corporation who, after de-rigging the ship, then used it as a floating petroleum depot in Ketchikan, Alaska. Nearly three decades later, she was taken out of commercial service and was on the verge of being sunk to form a breakwater when Honolulu Advertiser columnist Bob Krauss came to her rescue. In addition to a core group of local supporters primarily from Hawai`i’s maritime community, over the next several years school children across the newly-admitted state raised money to help bring the ship back to Hawai`i. Even the United States Navy provided assistance by towing the Falls of Clyde from Seattle to Honolulu in 1963. 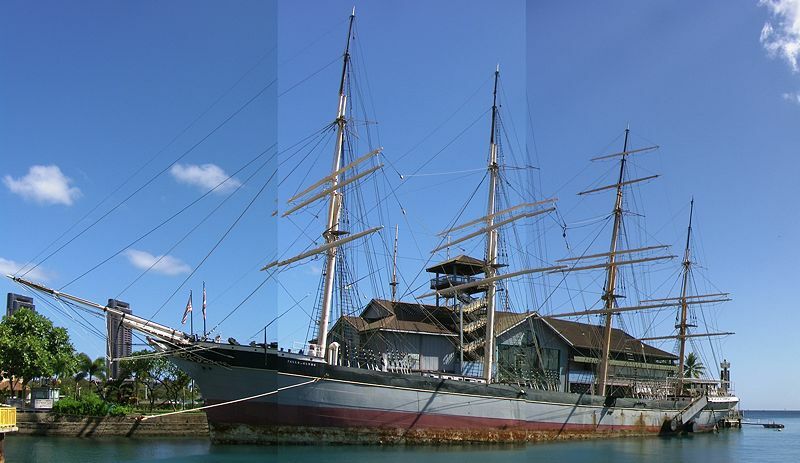 With the financial support from people around the world and hundreds of volunteers working on a variety of restoration projects, the Bishop Museum, which had taken over management of the ship’s operations, opened the ship to the public in 1971 at Pier 5 in Honolulu Harbor. Over the next decade, tens of thousands of people visited the Falls of Clyde. Unfortunately, during Hurricane Iwa in 1982, the ship sustained major damage when Pier 5 was destroyed. Over the next several months, several concerned individuals led by Bob Krauss formed the original Friends of The Falls of Clyde group which then took over control of the vessel after receiving permission to berth it at Pier 7. The Friends joined with the Aloha Tower Maritime Museum to form the Hawaii Maritime Center in 1988. A few months later, the Falls of Clyde was named a National Historic Monument by the National Parks Service, and additional restoration work began on a new forecastle deck and jibboom which was completed several years later. Because of the need for more financially stable leadership, the Bishop Museum came back into the picture in 1996 and took over the Hawaii Maritime Center, including responsibility for both routine maintenance as well as long-term restoration work on the Falls of Clyde. By early 2008, after receiving an estimate of at least $30 million to restore the ship, the Bishop Museum issued a contract to remove all valuable items from the ship including a priceless figurehead, to dismantle the rigging, and to prepare the Falls of Clyde to be towed out to sea for scuttling. Once word got out, several interested parties entered into discussions with the Museum, but other than delaying the actual scuttling date, no progress had been made to save the ship - until an ad hoc group of maritime enthusiasts and history buffs began to meet in mid-July, 2008, to figure out how to take back the ship’s ownership and then, over time, to restore it to its rightful place in Hawai`i’s history. On August, 28, 2008, the Friends of Falls of Clyde filed its initial paperwork with the Department of Commerce and Consumer Affairs and submitted its 501c3 non-profit tax-exempt organization application to the IRS on September 22. On September 25, the Museum's Board of Directors approved the sale. What a wonderful life this ocean wanderer has led sailing around the world under three separate flags. Even today, the Matson House flag which flies proudly from all its vessels includes a star recognizing the Falls of Clyde. 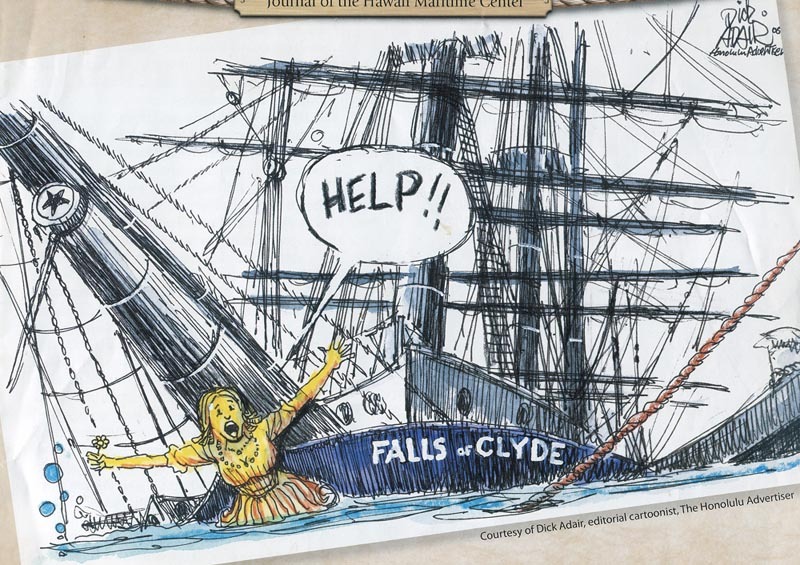 FALLS OF CLYDE - SAVED! I just received the following terrific news! Thanks to everyone who provided support. Of course, the ship has a long way to go before she is out of trouble. But it is certainly an important first step! The 25th is the day that the Bishop Museum Board will decide whether to give the Falls of Clyde a chance for a future or whether to destroy a 130 year old US National Historic Landmark. The outlook for the Falls of Clyde appears to be improving, though nothing is certain till the Board meeting. Bruce McEwan president of the Friends of the Falls of Clyde stated "At the meeting on September 22nd, it was agreed that Bishop Museum would allow the ship to stay at the current berth until she goes to drydock without charge or any change in the lease agreement between Bishop and DOT Harbors Division. I am sure that many of you who have been reading the posts on the Falls of Clyde will join me in wishing the Friends of the Falls of Clyde every success for this important day. The tally for the petition is now over 600. I will keep you all updated as and when more news comes to hand. One week to go before the Board of the Bishop Museum meet on the 25 September to decide the fate of the Falls of Clyde. The President of the Friends of the Falls of Clyde is due to meet with the principals of Bishop Museum on 18 September at 3 p.m. to hopefully finalize an agreement of sale. The Duke of Edinburgh, Prince Philip, as well as the Chairman of the World Ship Trust, Lord Greenway are reported to have expressed considerable interest and serious concerns at the proposed destruction of the vessel. For those of you that have not yet taken the opportunity to sign, it is not too late to make a difference. For others, don't forget that you might have friends or family that might like to help. The Coast Guard is establishing a temporary 500-yard moving safety zone around the S/V FALLS OF CLYDE and her tow vessel(s) during transit within the Honolulu Captain of the Port Zone. The safety zone is established at the request of the Hawaii Maritime Center to protect vessels and persons from approaching too close to the dead-ship tow of the S/V FALLS OF CLYDE. Entry of persons or vessels into this temporary safety zone is prohibited unless authorized by the Captain of the Port. SAFETY ZONE: This safety zone, in U.S. navigable waters within the Honolulu Captain of the Port Zone (See 33 CFR 3.70-10), from the surface of the water to the ocean floor, includes all waters extending 500 yards in all directions from the S/V FALLS OF CLYDE and her tow vessel(s) during transit from the Honolulu Harbor main channel commencing at a line between channel buoys no. 1 and no. 2 to 12 nautical miles off shore of Oahu, HI. This safety zone moves with the S/V FALLS OF CLYDE and her tow vessel(s) while they are traveling and becomes fixed when the S/V FALLS OF CLYDE is anchored, position-keeping, or moored. EFFECTIVE DATE: This rule is effective from 12:01 a.m. on September 2, 2008 until 11:59 p.m. on October 2, 2008. Grim, isn't it! Lets cross fingers that Friends of the Falls of Clyde meet with the success they trying so hard to achieve! FALLS OF CLYDE GIVEN AN 11TH HOUR STAY OF EXECUTION!!! The president of the Friends of the Falls of Clyde (FFOC) Bruce McEwan reported that the meeting held between representatives of the FFOC and the Bishop Museum on Wednesday 3 September had gone well. The FFOC presented how they intended to meet with the specified criteria set by the Bishop Museum including insurance. The Bishop Museum undertook to provide the FFOC with the document that would be used to convey the ownership subject to the FFOC meeting all their terms. Mr McEwan said "We are encouraged that we were well received by the CEO (Timothy Johns) and COO of Bishop Museum, but they made it clear that the final decision to transfer ownership rests with their Board of Directors, which is scheduled to meet on 25 September. "We still have work to do, but we are optimistic at this time that we will be successful. "We will need approval from the Bishop Board and the State Harbors Division to leave the ship at its current berth until we have drydock availability later this year. The outcome of this meeting, while very positive, does not yet guarantee that the Falls of Clyde would not be scuttled in the near future. Please keep watching what is happening to the Falls of Clyde, spreading the word to your friends and others about her plight, and of course encouraging people to sign the petition. It is important that when making their decision on the 25th, the board of the Bishop Museum have a full appreciation of how much the ship is valued by people in Hawaii, the USA and the rest of the world. If you want to contribute directly to the effort to save the Falls of Clyde, please send your donation to The Caledonian Society of Hawaii, P.O. Box 4164, Honolulu HI 96812-4164. Thank you to those who have already acted to help save the Falls of Clyde. To others, it is not too late to do something that will make a difference. The Friends of the Falls of Clyde have a meeting scheduled with the President of the Bishop Museum for Wednesday Sept. 3rd. I interpret that to mean that the Falls of Clyde will not be scuttled on Monday prior to such a meeting. So at the very least, everyone who has expressed an opinion to save the ship should be pleased that there is an 11th hour stay of execution. However, may I suggest that you keep up the pressure because agreement has not been reached and ownership has not been transferred. Even if the Bishop Museum decides to pass on the ship to new owners, there are still questions regarding the artefacts from the ship, private trust funds set aside for the ship, and restitution for any vandalism that may have occurred (institutional or otherwise). So please don't forget to sign the petition on http://oahure.com/FallsOfClyde/petition.php and tell others who might be similarly concerned. A community-based group filed papers yesterday to become a nonprofit organization in a last-ditch effort to save the deteriorating museum-ship Falls of Clyde. The group, which calls itself the Friends of Falls of Clyde, plans to present documents and a detailed plan to the Bishop Museum to preserve and restore the 130-year-old ship docked at Honolulu Harbor's Pier 7. Bruce McEwan, president of the group, plans to contact Timothy Johns, president and chief executive officer of the Bishop Museum, sometime next week to schedule a meeting. Despite the Monday deadline the Bishop Museum set for groups and individuals to submit a formal preservation and restoration plan, Johns said they are willing to meet with the group, which has shown a deep interest in saving the ship. Another local group that had expressed interest has backed out. Museum officials are also "increasingly uncertain" of an Australian man who had expressed interest to save the vessel, since he failed to provide documents and a detailed plan to preserve the ship. The Friends of Falls of Clyde also said they would keep the ship in Hawaii for preservation work. "Our preference would be to keep it in Hawaii if we have a choice," said Johns. The group has been meeting weekly for more than a month to brainstorm on attaining ownership of the vessel. McEwan said it was necessary to become a 501(c)(3) nonprofit, tax-exempt organization to ensure potential donors as well as public and private groups of their legitimacy and intentions. "There's nobody else who has the ability to step in and who has a plan," McEwan said. He obtained a liability insurance quote of $32,000 a year for the vessel and commitment from Marisco Ltd. to dry-dock the vessel at Barbers Point at an affordable cost. The group estimated preservation work to cost $1 million to $2 million. "We understand that it will be a major challenge," said McEwan, also chieftain of the Caledonian Society of Hawaii. A marine surveyor hired by the Bishop Museum estimated that it would cost more than $32 million to restore the ship. McEwan said there is national interest to save the ship. So far, about 500 people signed their online petition to save the vessel and for Bishop Museum to explore all options before scuttling the vessel. To access the online petition, go to www.savethefallsofclyde.com. subject to what is called a Section 106 review. However, nothing will happen unless the spotlight is squarely shone on the US government to be proactive in their involvement. The petition provides a relatively straight-forward method for you as concerned persons to express your views. Signing the petition will help provide a concentrated expression of public disapproval. Also, the Bishop Museum has had discussions with an Australian regarding the possibility of acquiring the ship. While this could provide a safety net should attempts to preserve the ship in Hawaii fail, the negotiations are still far from finding agreement, and the ship still remains at threat. After I issued a conditional concurrence concerning disposal of the Falls of Clyde vessel on July 14th, it came to EPA's attention weeks later that the vessel had been designated a national historical landmark pursuant to the National Historic Preservation Act (NHPA). As EPA is obliged to consult with the National Historic Preservation Office (NHPO) and its state office under Section 106 of NHPA prior to authorizing actions that may affect a designated landmark, we hereby rescind our conditional concurrence. We are in contact with NHPO and will work with them and the vessel owners to complete consultation as quickly as possible. At that point, we will reconsider your request for ocean disposal if it remains necessary to pursue that disposal option - the same details (i.e., disposal site coordinates, proposed tow plan) should remain in effect for the ocean disposal option. In the meantime, please contact us if you have questions about this consultation process or if any urgent situations develop in regard to the condition of the vessel. This is a very significant development. I originally wrote to the National Parks and Wildlife Service about the ship. I have seen correspondence that indicates that they are currently unconcerned about the destruction of this National Historic Monument. It sounds like it might be well worthwhile for others to express their concerns regarding the proposed scuttling of the Falls of Clyde as this very critical time. I suggest you write to the National Parks Service via the National Register email address nr_info@nps.gov. The more people object, the more likely they may intervene. I wrote to the National Parks Service regarding the threat to destroy the National Historic Landmark Falls of Clyde on 22 June, but have not yet received an acknowledgment nor reply to my email. I understand that the EPA has withdrawn approval to scuttle the Falls of Clyde pending discussions with the NPS to confirm your endorsement for the destruction of a National Historic Landmark. While I understand that to date the NPS has not taken a proactive stand to save the ship, I am writing this second email to appeal for the NPS to change its position to protect this wonderful old ship for future generations. The issue is not whether the US government should pay the $30 million to restore the ship. The issue is that a MUSEUM is threatening to throw away an irreplaceable piece of history. The Falls of Clyde is a historic artifact of Hawaiian, US and international significance. The Bishop Museum actions are premature in the circumstances and reflect their collection policies which do not focus on maritime history. The Falls of Clyde is still a very viable restoration. Just look at what they are doing with the Cutty Sark that was devastated by fire last year. The Bishop Museum wants an easy fix,$30 million up front. But the reality for most museums restoring ships is they have to act before they can see the light at the end of the tunnel. Being involved in ship restorations in the past, we used to say "Bite off more than you can chew and start chewing like mad". Fundraising is a progressive activity. Donations in cash and in kind by companies and individuals, contributions by volunteers and fund-raising activities such as art unions are all important additional sources of support which, when added to some Government support, can achieve the goal. These forms of support don't come easy, but they can be found provided a Museum stays positive and committed and progress can be shown. This is not the image projected by the Bishop Museum. 2. Provide enough seed money to ensure that the ship is safe and secure and in a position that facilitates ongoing restoration as funds become available. 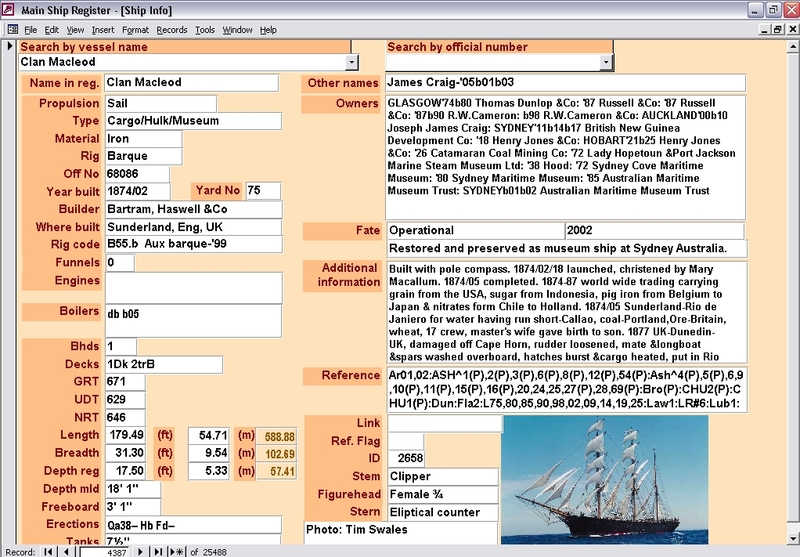 Further to my earlier email, you can view additional information on the method that the Sydney Heritage Fleet used to secure the James Craig on the web page www.boatregister.net/JamesCraig.html. There is also a power point presentation that will illustrate what the James Craig was like when we started, the pontoon dock that was used for the restoration, and what she is like today. While the estimated restoration cost of $30 million sounds like a lot of money, the cost needs to be put in perspective. With proper maintenance, the benefits from a comprehensive restoration of the Falls of Clyde will be available for the people of Hawaii and the USA for 50 years or more. How many properties in the better suburbs of Honolulu can you get for $30 million? Likewise, the cost of restoration is roughly the same as a city's fireworks display of 30 minutes on New Year's eve held over over 50 years. So for the equivalent of 25 hours of fireworks, you get a recognised National Historic Landmark for 15,000+ days available for the education of our children and our children's children. The Falls of Clyde provides a tangible link to a time before electronics, before mechanization, when those on board had to rely on their own good judgment and resourcefulness, a lifestyle that is almost inconceivable to people today. As a sailing ship, the Falls of Clyde is also one of the great symbols of harnessing renewable energy sources. And yes, the Falls of Clyde comes from the period of great historical upheaval to the native population of Hawaii, illustrating the commercial interests that drove the politics of the period. Surely passing on an awareness of these matters to future generations is an objective worth fighting for? I respectfully request that you as the Director of the National Parks Service intervene as a matter of urgency to prevent the destruction of the Falls of Clyde. The immediate threat has been averted. Bishop Museum has now back-tracked (TEMPORARILY!). The new date that they have set for scuttling the Falls of Clyde is 1st Sept 2008, a stay of execution for a month. Thank you to those who added their voices to help persuade Bishop Museum to think again. While this is good news in that there is some more time for action, the local group still needs support wherever it might be available. So please keep thinking about and exploring options for how we can secure the ship's future. ...just got word that the Bishop Museum has stuck with their original time table the FALLS is scheduled to be sunk on Tuesday Aug. 5. which was not what we heard at Monday's meeting from Blair. It looks like the situation is getting desperate. If you don't want to see this lovely old ship destroyed forever, write to Tim Johns President of the Bishop Museum at museum@bishopmuseum.org. Also write to one or more of the various people listed below. "The report of the Friends of the Falls of Clyde meeting that was held on 28 July focussed on the immediate issue of what would have to be done to save the ship. It was reported that, while the Bishop Museum was willing to see another party take over the vessel, they would only delay their plans to scuttle the vessel for a limited period, thought to possibly be till mid August. It was noted that the next Museum Board meeting of the Bishop Museum is to be held in about three weeks. It was imperative that the Board be presented with some sort of fleshed out preservation plan with a realistic budget, but taking into account generous offers of support through donations or 'at cost' provision of goods and services. There would need to be a non-profit organization to take responsibility of the ship from Bishop Museum, and this could also be discussed at the Board meeting. With this in mind, other items that were discussed at the Friends of Falls of Clyde meeting included potential groups that might take the vessel on, planning for project coordination, a project office, matters pertaining to purchase of the vessel (including fundraising, insurance, berthing, existing documenttion), securing of the vessel, short term restoration goals, partnerships with other organizations, A disturbing development was news that representatives of the San Diego Maritime Museum and Mystic Seaport Museum would be coming out to view the rigging fittings from Falls of Clyde for their own use. Their best guess was that as things currently stand, the ship had a one in five chance of being saved. The next meeting is scheduled for 4 August"
A meeting of concerned stakeholders was held on Monday 14 July in Honolulu to see what could be done to save the Falls of Clyde. About 30 people attended including members of the Propeller Club, Coast Guard officials, a representative of the Bishop Museum, original riggers of the ship, Harbor Pilots, a Maritime Archaeologist (who had done an 8 page recommendation for the reconstruction of hull etc. ), the Caledonian Society, the Navy League, a dry dock company that is considering dry docking the ship at cost and a towing company that will tow her there free. The meeting was described by one participant as hot and heavy because most people had no idea that the ship was to be sunk until the articles were leaked into the newspapers and magazines. A number of proposals were mooted. A company originally contracted to tow the ship out for sinking has refused to do so. The Bishop Museum agreed to stop dismantling the ship for the time being. 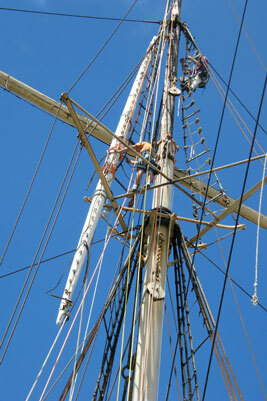 The spars and masts have been removed but they were in bad shape anyway. Another meeting is scheduled for next Monday. While this very small start has been a positive development, the Falls of Clyde is still very much in treacherous waters. I encourage any concerned persons to keep an eye on what is happening and to continue to actively lobby to save this very historic vessel. .....but have been flat-out on a major project: sending down the rig on the four-masted, full-rigged ship "Falls of Clyde", in Honolulu. It is exciting work, and it is a privilege to be aboard one of the finest square-riggers on Earth, but boy is it exhausting. Photos can be viewed at: http://www.briontoss.com/fallsofclyde/index.html (compare the current condition of the Falls of Clyde against the condition at the beginning of the restoration of the James Craig (2Mb)). http://starbulletin.com/2008/07/01/editorial/commentary.html - Thank you HSB! taking the ship to dry dock for repairs or for ultimate disposal. The following is what I wrote on the nomination. Perhaps you too would like to express your concerns by nominating the Falls of Clyde as one of Hawaii's Most Endangered Places. Briefly describe the site’s significance, including its historical, cultural, artistic, social and/or architectural value. The Falls of Clyde at Honolulu is one of the very few remaining nineteenth century square-riggers, the only remaining example of a four masted ship afloat, the only remaining example of a sailing oil tanker and the only remaining big sailing ship to have been registered in Hawaii.The Falls of Clyde is significant for Hawaii, for the United States and for the international community. Those who saved the ship in the 1960s understood this. It would be shameful thing for our generation to let her go and deny this wonderful historic artefact to future generations. Briefly describe the current physical condition of the property, the threats to the property and the rate of deterioration. The Falls of Clyde has been neglected. No ship can be left afloat indefinitely. Periodic docking is essential. Without a plan to undertake such basic maintenance, one cannot say that there has been a serious effort to conserve the vessel. However, the Falls of Clyde is still a viable restoration. Compare her against the James Craig that we have restored in Sydney which had been a wreck for 40 years. Falls of Clyde is nowhere near as bad a condition as our ship was. But by the same token, the days of just using the Falls of Clyde without getting serious about her restoration appears to have passed. It is now time to act. What are potential solutions? How and by whom could they be achieved? I was closely involved in the restoration of James Craig for 15 years and conceived the facility that made the project possible. The key solution was to put the ship on a pontoon dock so that work could be carried out as and when funds became viable without tying up a commercial ship repair facility. Our pontoon dock was purpose built. The cost in the 1980s was about $300,000. Today that might amount to $1 million. It was a big investment but it paid for itself many times over. That pontoon dock is still in use 23 years later, currently used for restoring another ship, the steamer John Oxley. As an alternative to building a new dock, it might also be possible to source an existing vessel (perhaps a surplus floating dock or a barge from the offshore industry). Once the Falls of Clyde is docked on the pontoon dock, that will provide a buffer against rash action and allow a slower more paced and probably more economic approach to the restoration. It is probably unrealistic to hope that a benefactor will arrive with $30 million like a knight in shining armour. My experience is that success builds on success. By the same token, people tend to hold back until they see a commitment from others. Funding is much more likely when potential benefactors can see a plan for the future that provides for a reasonably viable way ahead. Putting the Falls of Clyde on a dock will help achieve this. Just as importantly, it provides for a much more realistic short term target of $1 million instead of $30 million. http://www.shf.org.au/JO-restoration/JO-docking.html which explains how the dock operates and shows the current restoration project, the John Oxley, on the dock. I am writing to the US National Parks Service to express my concern that an important historic artifact of international significance is apparently under threat of being destroyed. The Falls of Clyde at Honolulu is one of the very few remaining nineteenth century square-riggers, the only remaining example of a four masted ship afloat, the only remaining example of a sailing oil tanker and the only remaining big sailing ship to have been registered in Hawaii. The Falls of Clyde should be treasured, not threatened. Thanks to the foresight, dedication and effort of many people in years past, the Falls of Clyde has survived relatively intact. As a person who was closely involved in restoring the James Craig in Sydney that had been a tidal wreck for 40 years, I believe that comparatively the Falls of Clyde is still a very viable restoration proposition. Those who originally had the foresight to save the ship and restore her deserve better than apathy from a current generation that would let her go without a struggle. The barque James Craig took 28 years to restore. The project would never have succeeded had we given up each time we ran out of money. I can recall many occasions when work ground to a standstill for lack of funds. Of course, at such points, the project was always at greatest risk. The key strategy to deal with this is to ensure that the ship during restoration remains sufficiently independent of its supporting infrastructure that it can ride out the lows. This was done by placing the James Craig on a pontoon dock, a large barge. In this position for 14 years she was independent of dockyards, land-owners, etc. She could be moved from place to place as the need arose and worked on at a quick pace or a slow pace depending upon the state of funds. In the toughest times, she was effectively kept in cold storage. The approach was so successful that the James Craig's pontoon dock is currently being used to restore another ship, the steamer John Oxley. Rather than considering whether to scuttle the Falls of Clyde, effort might be better spent finding a large barge or pontoon or even having one built as we did with James Craig. Once the Falls of Clyde is docked on the pontoon dock, that will give a buffer against rash action and allow a slower more paced and probably more economic approach to the restoration. With this in mind, I request that the US National Parks Service step in to save what is a national and international icon by providing the funding needed to raise the ship onto suitable barge or floating dock structure. I was the designer of the floating dock used to restore the James Craig. Please feel free to contact me should you wish to find out more about the approach we used. The Bishop Museum says it may have to sink this historical vessel. When HONOLULU Magazine published the first list of “The 9 Most Endangered Historic Sites in Hawaii,” compiled by the Historic Hawaii Foundation, one of those sites was the Falls of Clyde at the Hawaii Maritime Center. The 130-year-old wrought iron vessel is the last surviving member of Hawaii’s original Matson fleet and the world’s only surviving full-rigged, four-masted sailing ship. The threat then, in 2005, was physical deterioration. The late Bob Krauss, The Honolulu Advertiser columnist who had been instrumental in bringing the ship home from the Mainland in 1963, noted that most fund-raising since the ’60s had gone to cover the ship’s debt, while maintenance had been deferred. Last February, the Bishop Museum, which operates the Hawaii Maritime Center, closed the Clyde to visitors out of safety concerns, and, in April, brought in marine surveyor Joseph Lombardi, owner of the Massachusetts-based Ocean Technical Survey. Dec. 12, 1878, in Port Glasgow, Scotland, on the banks of the River Clyde. 1898. Served in Capt. Matson’s growing sugar fleet, running from Hilo to the West Coast more than 60 times between 1899 and 1907. In 1907 into a sail-powered oil carrier, bringing oil to Hawaii’s sugar plantations. In 1920, the Clyde left the Islands, changing hands repeatedly until 1958 when it seemed the obsolete vessel would be scrapped. In 1958, a private owner buys the Clyde, tows it to Seattle, and tries to find a city that will adopt it. Advertiser columnist Bob Krauss and other Hawaii philanthropists launch a grassroots effort to save the ship, raising $35,000. By 1963, the ship becomes a fixture on the Honolulu waterfront, undergoing $3 million worth of restoration over the next 34 years. Johns said the museum would search for a benefactor until June, and then would have to make other plans for the Clyde, including disposing of the ship. The museum faces three expensive possibilities. The ship could sink at its pier—worse, it could roll over as it sinks, doing damage with its tall masts. Or, the museum could strip the ship of all salvageable artifacts now, and document it for posterity, then sink it. Even then, Lombardi says the Clyde needs to be reinforced to be towed safely to its final destination. So far, says Lombardi, there have been a few inquiries, but no solid lead. Meanwhile, there’s a month left. If you happen to be a billionaire with a thing for old ships, call Johns now at 848-4142. The celebrated Glasgow Falls Line, which consisted of nine magnificent Russell-built four-masters, was started by Wright & Breakenridge (afterwards Wright, Graham &Co) in 1878. These ships which, with the exception of the last three, were square rigged on all four masts and besides being good carriers were noted for their speed off the wind. Notes on the Falls Line. The pioneer ship of the fleet, the Falls of Clyde, is still afloat. This beautiful four-mast ship, which was very fast and could do her 15 knots without much pressing, was eventually sold to Captain Matson of Honolulu, who turned her into a barque. A few years later she was bought by the Anglo-American Oil Co. and was employed amongst the oil sailing fleet carrying kerosene from the States to the East. Then she went to the General Petrolum Corporation who converted her to a barge at Los Angeles. Her sister ship, the Falls of Bruar, on the other hand had a very short life, being lost on September 2, 1887. Tanks, etc:10" Cargo Tks &db '07 Freeboard: 5' 2"
Fate/Status— Year: 2001 Type: Stationary Details: Converted to oil barge 1922. Museum ship Honolulu since 1968. History and details:Sister-Falls of Bruar. Lnched 12/12. Not lucky but quite fast, 327nm/24hrs, a handy ship. 1878-98 Calcutta trade. FB 5' 1" by L90. 1892 Calcutta-San Francisco 155dys. FB 5' 1½" by L98. 1899/01/20 arrived at Honolulu under Hawaiian flag. 1899-1906 San Francisco-Hilo trade, general cargo outbound, sugar homebound, also carried some passengers. Charthouse & additional deckhouse added by Matson. 1809g/1748n FB 5'1½" O/N u121138 by L02. 1907 converted to sailing tanker 10 tanks. 1907-16 oil trade between Gaviota near Santa Barbara &Honolulu, 17crew. 1913 collided with inter-island steamer, lost figurehead, replaced. 1916 transferred to oil/molasses trade between San Franicisco &Honolulu. Honolulu-San Francisco 11dys c1916. (post?) WW1 made 2 vyges to Europe with oil. 1921-22 chartered. 1921 Buenos Aires-San Francisco, last vyge under sail. 1922 hulked, converted to barge. 1922-1957+ floating oil barge and filling station at Ketchikan, Alaska. 1957 figurehead in Seattle museum. 1959 towed from Ketchikan to Seattle. 1959 Karl Kortum & Fred Klebingat attempted to raise interest in preservation, Long Beach showed interest for a period. 1963 purchased for preservation using funds raised by population of Hawaii, towed to Honolulu by US Navy with assistance from Matson Shipping Co. 1983 displayed at Pier 5 Honolulu Harbour. Fur says '00 Matson:'06 Assoc.Oil:'07 Gen Petr.Lub difs. *Bro1 sys 4mstBk '98.